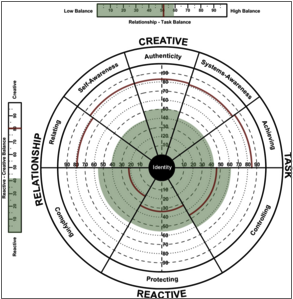 The Leadership Circle Profile is one of the most highly regarded and comprehensive 360° assessments in the leadership development marketplace. The assessment captures – in a compelling graphical format – the extent to which executives and managers are realizing their full potential across a wide variety of creative leadership dimensions. It also assesses how they are managing reactive tendencies that may limit their effectiveness as leaders. The profile accomplishes this in part by capturing how individuals see themselves as leaders in areas such as authenticity, strategy, vision, interpersonal skill, and systems thinking and then comparing this self-assessment with how others – colleagues, peers, direct reports, and bosses – evaluate their performance. Kenning’s Neil Stroul led the charge for the firm to adopt the Leadership Circle as our primary 360° assessment tool by becoming the first partner to go through the certification process. Kenning is now using the Leadership Circle Profile to renew and enrich long-term existing coaching relationships with executives looking for new ways to reflect on and engage their development. We are also using it as a way to initiate new coaching relationships with clients interested in a comprehensive 360° process and coaching support. Kenning also offers two other Leadership Circle tools: the Leadership Circle Profile for Managers, designed for individuals at the beginning of their leadership trajectory, and the Leadership Circle Culture Survey. The Culture Survey evaluates the collective leadership culture within teams and organizations and suggests opportunities for building a leadership ethos that will engage and inspire the widest possible array of stakeholders. The Culture Survey also highlights how a client’s leadership culture compares to that of other organizations, providing additional valuable insights. For more information about our Leadership Circle work, please contact us.